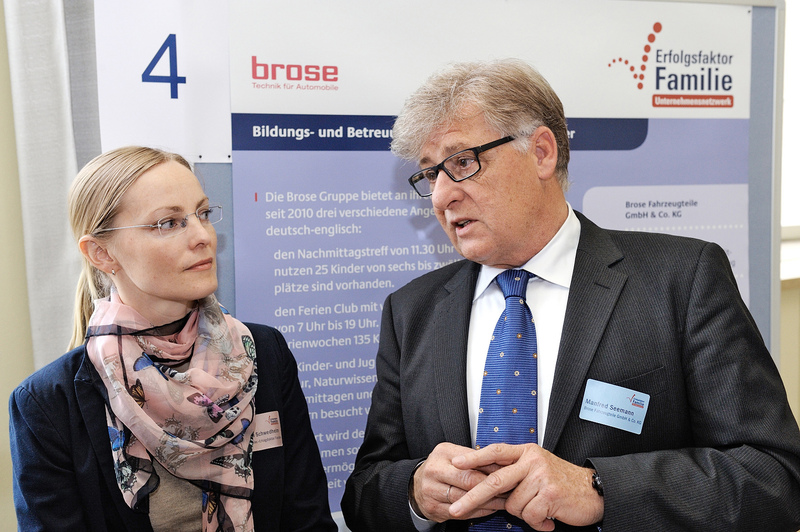 Manfred Seemann (Director Employee and Family Services) was on hand to talk to participants in the exhibition area after the congress, along with Corinna Schwedhelm (Project Officer, Netzwerkbüro Erfolgsfaktor Familie). Large firms in particular, like Fraport (Frankfurt Airport), welcomed the opportunity to discuss the Brose Kids Club in more detail. This year’s Erfolgsfaktor Familie (“Success Factor Family”) congress on May 22, 2013 focused on 11 models of corporate childcare. Among the companies presenting childcare concepts were chemicals company BASF, pharmaceuticals firm Boehringer Ingelheim and toy manufacturer HABA. The Brose Kids Club was also presented and met with great interest from the 350 congress participants. Kristina Schröder, Germany’s Minister for Family Affairs, Senior Citizens, Women and Youth, and Eric Schweitzer, President of the Association of German Chambers of Commerce and Industry, opened the event. A year ago, Brose won the “Erfolgsfaktor Familie” innovation prize in a business competition for its concept enabling employees to combine work and family. “The expansion of childcare provision is of key importance in ensuring better compatibility between work and family,” Kristina Schröder, Minister for Family Affairs, said in her speech at the start of this year’s “Erfolgsfaktor Familie” congress on May 22, 2013. “It not only benefits parents, but also employers who have young parents in their workforce. So I am delighted that more and more companies are offering childcare services and expressly encourage those who are considering doing so.” The event focused on 11 models of corporate childcare. Among the companies presenting concepts alongside the Brose Kids Club were chemicals company BASF, pharmaceuticals firm Boehringer Ingelheim and toy manufacturer HABA. One of the key issues discussed by the 350 congress participants was: Does corporate childcare also make commercial sense? Manfred Seemann, Director Employee and Family Services, is convinced that a family-friendly approach has a positive impact on employee motivation: “People who have enough freedom to perform their family duties have more energy for their work within the company,” he explains. Gabriele Chrubasik from the HR department at Boehringer Ingelheim, provides hard figures: “We have calculated that for every euro we invest in childcare we get back around four euros.” Alfons Scheitz of Impuls Soziales Management mentioned another positive effect of corporate nurseries in terms of costs and benefits: they are particularly popular with specialists and managerial staff. According to Scheitz, the following rule of thumb applies: “The more skilled the workforce, the greater the demand for childcare places.” This makes companies that offer childcare more popular than ever as employers and strengthens their employer brand.